Hunting. Mining. Pipelines. 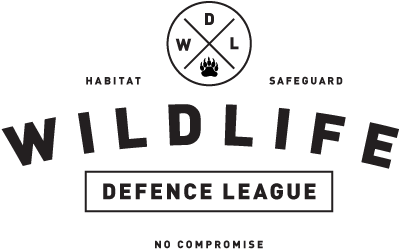 These are just a few of the threats that Tommy Knowles and the Wildlife Defense League are blockading in order to protect our natural world. After the launch of Operation Great Bear in September, the WDL has allied with the Klabona Keepers of the Tahltan Nation to successfully prevent trophy hunters from killing grizzly bears in the region. However, the bears are not Tommy’s sole priority, as the area is also threatened by industrial developers such as Kinder Morgan and Imperial Metals, who severely pollute the land and water, which harm and kill the animals living there. After the time he spent with Sea Shepherd, Tommy’s experiences have influenced the tactics he employs to protect animals in British Columbia. Tommy notes that animals such as sharks and wolves have been scapegoated in order to justify industrial development. He strongly supports the use of direct action, and has put his life and body on the line. Tommy also calls for the use of independent (not government-sponsored) research to understand the detriments of hunting and fishing on both the animals themselves as well as on ecosystems. **We apologize for the audio quality in the first half of the interview. We were experiencing technical difficulties! Tags: Direct Action, Hunting, indigenous rights, operation great bear, Sea Shepherd, tommy knowles, wildlife defense league. Bookmark the permalink.